In general, all email harvesters work at the same principle – they are designed to retrieve email addresses from the websites, searching engines, and local files. Email extractors may differ mainly in features, interface, speed, and stability. The customers give preference to WebPro Email Extractor since it superior to all other email extractors available on the Internet. If you compare WebPro Email Extractor to other applications out there, you will find that our software runs faster and with no failures. And if you have an experience of working with email extractors, you should know how essential the speed is. Even if the program works automatically, it can take time to make up a large mailing list. That is why speed is an essential feature in choosing the right software. 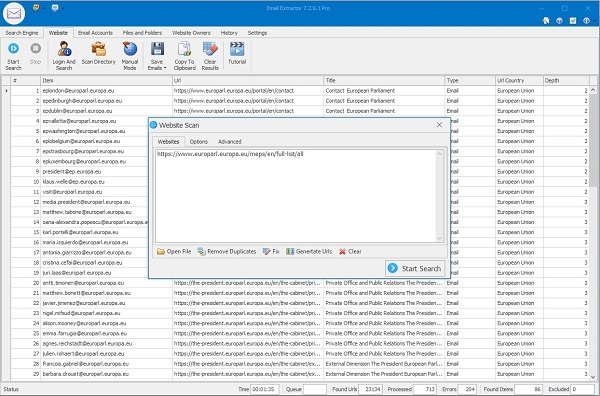 Except of standard ability to extract email addresses from the search engines, websites and local files, Email Extractor allows also to search WhoIs and an entire list of URLs. The process of installation is also as simple as one two three. Even a person with no special computer skills can easily manage the process of installation. Email Extractor’s intuitive interface is extremely easy to use. There are no confusing features or menus. Everything is on the surface and distinctly visible. We ensure all our customers excellent technical and sales support. But the most important of all, we provide absolutely free updates of the software. And you don’t have to renew your Email Extractor license every year. You can contact our support team on any question according the software or sales inquiries. Email Extractor features an innovative technology that enables fast and in-depth search of email addresses over the Internet. Moreover, our software provides a number of special options, which are not available in other email extraction applications. Recent version of Email Extractor allows retrieving complete contact information from WhoIs data. Except of email address you can also get domain and server name, fax and telephone number. Numerous options and smooth performance makes Email Extractor the best email harvester available on the Internet.